At the seminar of 'Levende talen' (modern languages) ​​in Utrecht (NL) Digischool 3D won two prizes with their 'virtual language villages' project. One prize was awarded by the public and the other was an honorable mention from the jury of the European Language Label. 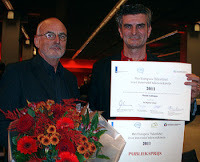 The European Language Label is a European prize for innovative language projects. In the Netherlands, the European Platform, which promotes internationalizing education, organizes this contest, commissioned by the Ministry of Education. In total, the jury examined 30 entries, nine of which were selected. This selection was invited to the seminar to show the projects to the jury and the public. Koos Boekensteijn (English Community manager) and Nick Zwart (3DLES, creator of the language villages) received the two prizes. The virtual language villages are built by 3DLES at the OpenSim grid of virtyou and are open to the public. 3DLES and virtyou created a special EDU area at the virtyou grid where several educational projects can be found. Among them you can find: two language villages of Digischool, three Niflar language regions, Devil Island Mystery of Chris Surridge, Sloodle 1.0 testing regions, the University of Tilburg with a Hebrew region, etc.